As part of our fight against the overuse and misuse of high-stakes standardized testing, More Than A Score is pushing back against the plan for Chicago Public Schools to hand our children’s private data over to the Illinois Shared Learning Environment (ISLE), a statewide longitudinal database powered by technology designed by Rupert Murdoch’s Amplify. We are concerned not just about how ISLE/InBloom technology will impact students’ privacy rights (read more about those here), but also how it will impact the type of human-human interactions that ought to comprise the majority of the time that children spend in school. In particular, we fear that ISLE will encourage the worst aspects of current educational trends: large class sizes, teaching to the test, and inauthentic assessment. 1) More computers, fewer teachers: Labor is the single largest cost in education. Replacing computers with teachers means billions of dollars of public education funding can go directly into the coffers of education technology companies, like Amplify, Scholastic, Pearson, and Microsoft. Teacher-less classrooms are already in use throughout the country, from the scandal-ridden virtual charters of Pennsylvania and Ohio to Rocketship Education, a charter school chain based in California, which is rapidly colonizing the Midwest, including plans for one in Chicago. Already here in Chicago, the Gates Foundation-funded Intrinsic Schools charter chain has opened one campus with four more planned. The school intends to have a teacher-student ratio of 1:45, shockingly large even in a district where anything less than 36 children per classroom counts as “efficient”. Students at Intrinsic will spend 50% of their time on “using digital content for literacy and math”, i.e. working alone on computers. Rather than personalizing learning through smaller class sizes, a method with stacks and stacks of social science research supporting it, a system like ISLE will instead depersonalize the learning process by shifting from education via human contact to education mediated primarily via computer and tablet. 2) Digital test prep is still just test prep: Because of the emphasis on standardized test results, in large, urban districts like CPS, ever more time has been spent teaching to tests, narrowing what students are expected to learn and how teachers try to teach them. Worksheets and test prep have replaced free play in younger grades and project-based learning in upper ones. Math and reading—and only math and reading—take up larger and larger amounts of the school day. Systems like ISLE will only exacerbate these trends. 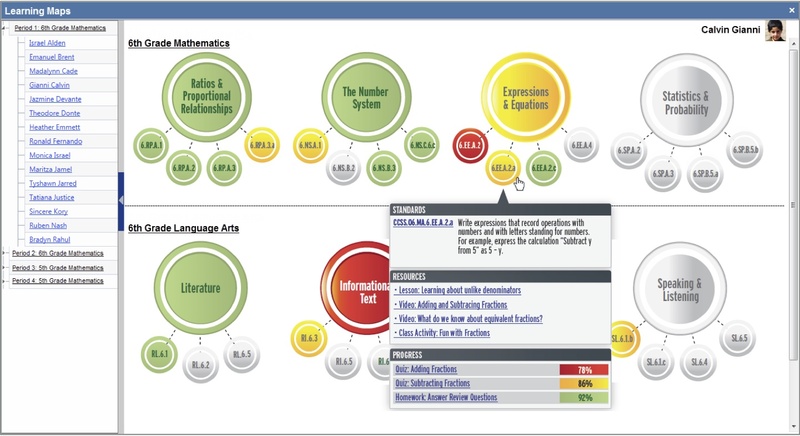 Rote learning, drill-and-kill activities, and multiple-choice worksheets are easy to convert to computer applications. Video lectures can replace in-person explanations. In addition, the adoption of the Common Core State Standards (CCSS) in the majority of states is rapidly creating a de facto national curriculum and market for lesson plans, homework assignments, and, of course, tests. ISLE will supply teachers with pre-existing banks of online lessons, assignments, and assessments—all tied to so-called “learning maps” aligned with the Common Core standards. Student learning experiences in an ISLE-driven education are only “personalized” in the sense that at any given point, each child may be using a different application, working on a different standard, or taking a different assessment—little or no human contact with teachers or fellow students is needed. 3) Computers can’t tell us what our children are learning: Assessment via computer is already a reality in the Chicago Public Schools. Millions of dollars are spent each year on computerized standardized tests to be given to children as young as five from their very first days at school, with predictably inhumane results. Unfortunately, computer assessment techniques are fundamentally incompatible with authentic assessment practices that provide meaningful information to teachers, students, parents, and communities about what students are learning. Even experts in computer science leading the push for education technology like massive online open courses (MOOCs) admit that we cannot yet use computers for assessment tasks more complex than multiple choice questions. Automated essay and short-answer grading are still in their infancy, serving only as a “complement to the work of a human instructor”. (For example, the Educational Testing Service makes use of its e-rater automated essay grading for the GRE, but only as a backup score for comparison with a human essay evaluator.) Automated evaluation of written responses are still easy to game and unable to evaluate factual correctness. And, perhaps more importantly, they may never have the ability to be meaningful recipients of students’ attempts to communicate ideas and emotions. A public education system in a 21st century democracy requires evidence of learning of a vastly different sort than the ability to answer multiple-choice questions correctly.